Rival Gaming is a seasoned developer of online casino games, highly praised in the industry for its creativity, integrity, and dependability. The software supplier has developed over 160 bespoke games which are available across a wide range of desktop and mobile devices. Committed to quality and playability, Rival Gaming has succeeded in attaining a strong position in the online casino industry and has made a tremendous progress in the past decade. The developer’s gaming library is certainly multifarious as it spans an extensive range of titles which boast some awesome features that keep players from around the world coming back for more. The portfolio consists of various bespoke table games, video poker variations, arcades, scratch cards, and premium slots, which are available in download, instant play, and mobile formats. Each title impresses with great graphics and boasts a number of handy features that would surely keep players on the edge of their seats. As is usually the case, Rival Gaming’s progressive slots are in exceptionally high demand in online casinos running on the suppliers’ cutting-edge software. Although Rival has fewer progressive titles to offer, especially in comparison which some other developers in the industry, each progressive slot on its catalog is well worth players’ time as it gives them the opportunity to potentially pocket a hefty amount of money and have a good deal of fun in the process. Read on to find out more about Rival Gaming, its progressive slots, their features, and how their pools are accumulated. The history of Rival Gaming started over ten years ago when the company was founded on the isle of Cyprus. The company’s unique GIGse platform quickly gained popularity and today over 52 reputable casino operators have adopted the developer’s first-rate software. Apart from its extensive gaming catalog, Rival is also responsible for the introduction of the bespoke Casino Controller platform which boasts various handy features that both casino operators and players can benefit from. Over the past ten years, Rival Gaming has developed a premium suite of graphically advanced games to be played in both downloadable and browser environments. The developer keeps track of the trends in the industry as becomes evident by the introduction of its Rival Mobile casino collection in 2014. The company boasts one of the most rapidly growing mobile games portfolio in the industry as the suite now offers over 30 slots and casino games and keeps growing on a monthly basis. The mobile collection utilizes the cutting-edge php5 technology, which means the games on offer are compatible with all widespread mobile devices one can think of. But more importantly, players get to engage in the games on the go without having to purchase, download and install any native mobile software. Slot fans, in particular, will be thrilled by Rival Gaming’s fantastic i-Slots™ collection. The developer emphasizes on the games’ plot as slots from the collection enable players to progress through the storylines. Interestingly enough, the i-Slots™ titles feature intricate storylines and pose as a combination of different genres and styles which further increases their value. The i-Slots™ games guarantee a unique 3D experience and allow players to make decisions as to how the storyline will progress. The story consists of different stages players can go through as long as they unlock the next stage by landing a specific combination of symbols across the reels. What is truly unique about the i-Slots™ games is that winning credits becomes almost secondary, this is how enticing the slots’ storylines are. Players can replay a given game because the stories are not static and there are many different outcomes to any given Rival slot. This means slot fans can return and replay their favorite i-Slots™ title whenever they like and enjoy a totally different gaming experience. In addition to the advanced graphics, great animations, and easy-to-navigate interface, slot fans will be able to benefit from other extra features, including bonus games, free spins, bonus symbols, multipliers, wilds and scatters. Slots from the i-Slots™ collection are certainly in high demand but it is Rival’s progressive jackpot titles that enjoy the greatest popularity among reel fans. This is easily explained with their massive winning potential since Rival’s progressive slots tend to reward players with rather lucrative sums and offer an average payout rate of about 95%, which is quite satisfactory for progressive games. Unlike standard slots where the jackpot amount is fixed, the prizes in Rivals’ progressive games continue to increase incrementally until somebody wins. Each time a given player makes a bet and sets the reels in motion, a small amount is subtracted from their stake and is added to the increasing communal pot. This way, players from all over the world contribute to the accumulation of a given progressive slot’s jackpot. Note that play from all online casinos running on Rival Gaming’s bespoke software contributes towards the progressive pool. The amount subtracted from each player’s bet is typically rather small and ranges between 1% and 2%. It is important to mention that the subtraction of the said amount from each wager affects the progressive slots’ average payout rates. This tendency can be explained by the fact players’ contribution to the pot is built into the games’ average payout percentages. The goal is to balance out the potential of someone collecting the massive progressive payout. This is less blatant on individual spins but over the long run, slot fans will surely notice this tendency. However, this by no means should prevent players from testing their luck on some of Rival Gaming’s progressive slots. As there are practically tens of thousands of players contributing to the pools on every single spin across all Rival-powered casinos, the prize usually escalates to reach a five and even a six-figure amount. Sooner or later, someone will eventually land the winning combination of symbols at random and will collect the huge pot. Once the progressive prize is won, the entire process repeats itself. However, it is important to note that the jackpots on Rival Gaming’s progressive slots start accumulating from a designated amount, referred to as the “seed.” The different Rival Gaming progressive slots seed at different amounts. It is typically the online casino operators using Rival’s software that contribute with the seed amount. Players may notice they tend to hit regular wins on progressive slots less frequently. As was mentioned earlier, Rival Gaming has currently launched only a few progressive slots. However, each of the five progressive titles we have reviewed below is well worth the time of slot fans since the games not only carry great winning potential, but are also impressive in terms of graphical presentation and interface. Strike Gold is among the most popular titles on Rival Gaming’s catalog. The game poses as a throwback to classic, 3-reel slots but with a twist. The graphics are rather sleek while the clean, user-friendly interface allows for easy navigation even if this is one’s first time spinning the reels. Strike Gold utilizes traditional symbols such as the bar icon, pots of gold, and gold coins. There is a single payline which stretches across the middle of the three reels. Despite being a 3-reel slot, Strike Gold boasts some additional and useful features such as wild symbols and multipliers. The maximum bet in the game is set to two coins and the only coin denomination available is $1, or the equivalent in players’ currency of choice. Players can keep track of the current progressive jackpot amount which is displayed in the jackpot meter at the top of the screen. To qualify for the progressive prize, one is required to bet the maximum amount, allowed in the game. The progressive jackpot is awarded to the player, who lands three symbols with the Strike Gold logo on the payline. Players, who have not placed the maximum bet but still land three jackpot symbols on the payline, will be rewarded with 2,000 credits. 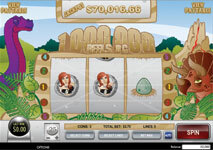 Once the jackpot is won, it is reset to its base (or seed) amount, which is $5,000 in this instance. 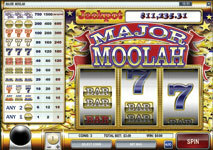 Major Moolah is another appealing creation of Rival’s which carries a huge winning potential. This slot is the perfect alternative for both seasoned and inexperienced players due to its simplified interface and easy-to-master gameplay. The game is played across 3 reels and has only one payline to offer. Rival Gaming has once again opted for traditional symbols like bars, lucky sevens, and gold stars. Players are provided with the opportunity to bet between one and three coins per spin. The name of the game pretty much speaks for itself as slots fans can indeed collect a hefty progressive payout as long as they bet the maximum number of coins per spin. Major Moolah’s progressive prize is triggered at random, as is usually the case with most progressive slots. To claim the pot, one needs to hit three Major Moolah symbols (represented by an “M”) on the payline. Players, who have bet one or two coins only and succeed in landing the three jackpot symbols, will earn 750 or 1,500 credits, respectively. When reset, the progressive jackpot in Major Moolah starts seeding at a base amount of $2,700. Money Magic is deemed a more suitable alternative for video slot fans as the game features 5 reels and has a total of 9 adjustable paylines to offer. Rival Gaming has opted for a circus theme for this slot as becomes evident by the symbols players will come across the reels. These include bunnies, top hats, pigeons, magicians, and showgirls. Once the game loads, players will immediately notice it is more advanced in terms of visuals and features. Slot fans will benefit from scatters and wild symbols. The wild here is a posy of colorful flowers. It is precisely this symbol that can potentially unlock the progressive jackpot. Those, who land five jackpot symbols on one of the paylines (it needs to be an active one mind you), will collect the progressive prize provided they have played the maximum number of coins on this spin. The maximum bet per spin is set to five coins, with fixed denomination of $0.5. Once a player collects the prize, the pot is reset to its base amount, which is $2,500. Inspired by prehistoric times, One Million Reels BC is a fun 3-reel slot, which impresses with vibrant and colorful visuals and simplified interface. There are 5 adjustable paylines to bet on, with the option of choosing up to three coins per line, with fixed denomination of $0.25 or the equivalent in your preferred currency. Keeping in line with the general theme of the slot, Rival Gaming has opted for incorporating various dinosaur eggs, a caveman, and a cavewoman as symbols on the reels. The jackpot is randomly triggered whenever someone lands the T-Rex symbol on one of the paylines. This symbol is also a wild with a 2x multiplier attached to it. The progressive jackpot in One Million Reels BC seeds at $4,000. This is yet another fantastic 3-reel slot, courtesy of Rival Gaming. The slot may be a bit simplified in terms of graphics and features, but it is still worth your while as it comes with a rather sizeable progressive jackpot that usually falls into the six-figure range. 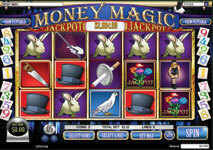 The slot has 3 adjustable paylines to offer and utilizes classic symbols the likes of lucky sevens, bars, and cherries. Players are provided with the option to bet between one and three coins per payline, with a fixed coin value of $0.25. The symbol you need to keep an eye on is the 5x icon as it is the wild in the game and as such, can substitute for all other symbols, helping you form more winning combinations on the paylines. To take home the progressive prize, players are required to hit three 5x symbols on one of the three paylines. Of course, betting the maximum stake is a necessary requirement to qualify. Otherwise, players will earn 1,500 or 3,000 credits provided they have bet one or two coins per line, respectively.